IMMERSION BREWS & MEASURING EXTRACTION - Marco Beverage Systems Ltd.
Vince Fedele of VST, the coffee industry leader in brewing measurement devices, amongst other things, delivered a very notable talk at the Nordic Barista Cup last weekend. Go to the NBC site to see a video of his talk. The key subject of twitterdom and indeed the talk of NBC attendees was the apparently heretofore incorrect charting of immersion brews on traditional brewing charts. 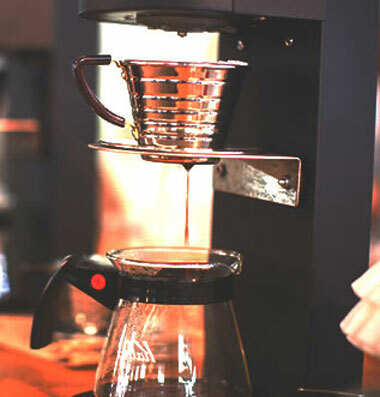 – when one uses immersion, steep or infusion brews, the total brew water volume extracts coffee solids. – when the brew is ‘complete’ to one’s taste, the beverage is filtered through whatever medium the brew method presents (paper, steel mesh, etc). – the coffee grinds absorb approx twice their dry weight of the liquid, IN THIS CASE BEING THE BEVERAGE. – thus, the grinds retain some of the extracted coffee which was dissolved in the beverage. – using 60g of dry coffee and 1 litre of water in an immersion brew method. – assume 1.5% strength of final beverage for calculation purposes. – assume 2g of liquid absorbed by 1g of dry coffee. – thus, 60g of dry coffee absorbs 120g of brewed coffee. – thus, 1.8g of this dry coffee is dissolved in the 120g of the retained brew(120g x 1.5%) and is NOT in the final beverage. – this 1.8g of dissolved coffee must therefore be excluded from the final beverage. – this 1.8g as a percentage of the original 60g is 3%. – thus, a brew calculated as 17% extraction using current norms is indicating 17% of the original dry coffee has been dissolved in the beverage. – if 3% of the original 60g is retained in the grinds, the actual extraction is 20%. Thankfully, Vince’s wonderful new software does all the calculations for you.